Happy Cool Caturday furiends. The temperature has dropped here today but it’s actually great for the varnishing because the humans aren’t supposed to do it in direct sunlight anyway. They are busy working hard and I’m enjoying some time out with my mice while I watch my minions from the comfort of my throne I mean bed! I hope you’re enjoying a pawesome Caturday too! « Sharkie and Blue swam home! Do keep an eye on your humans, Bailey – you don’t want them shirking off! Happy Happy Caturday to YOU! they tend to slack off! What better way to spend a Caturday like a true Admiral than resting with micies on your throne while supervising the humans as they keep up and pamper your beautiful Nocturne. You are a true mancat of the sea Bailey, if you ever sail to the Pacific Coast we would be honored to meet you! Gotta keep an eye on the humans… good job, Bailey! 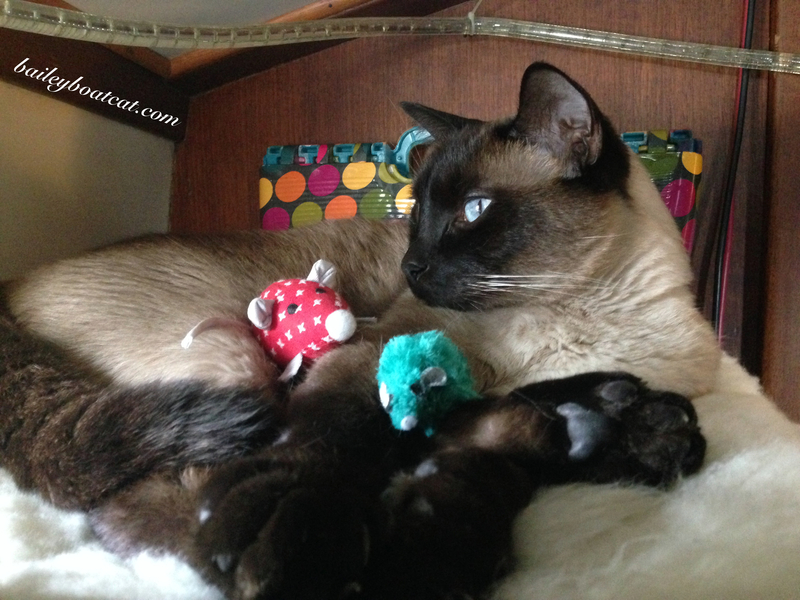 Yur a kittboy aftur mee own heart bailey…mee LUVSS mee mousiess too! !